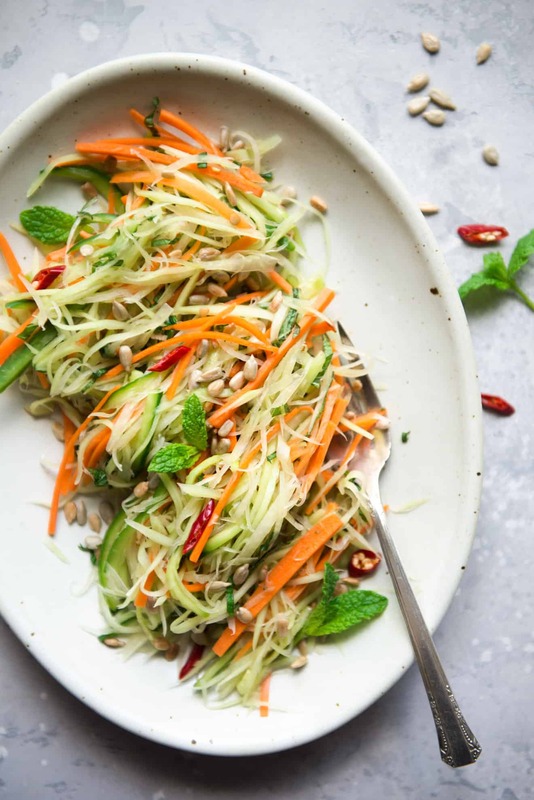 This vegan green papaya salad is a delicious light appetizer. It is dressed with a tangy and mildly sweet dressing made of rice vinegar, garlic, shallots, soy sauce and maple syrup. One of my favorite dishes in Southeast Asian cuisine is green papaya salad. It’s tangy and light, and it does exactly what it is supposed to do: prepare our appetite for the main meal. 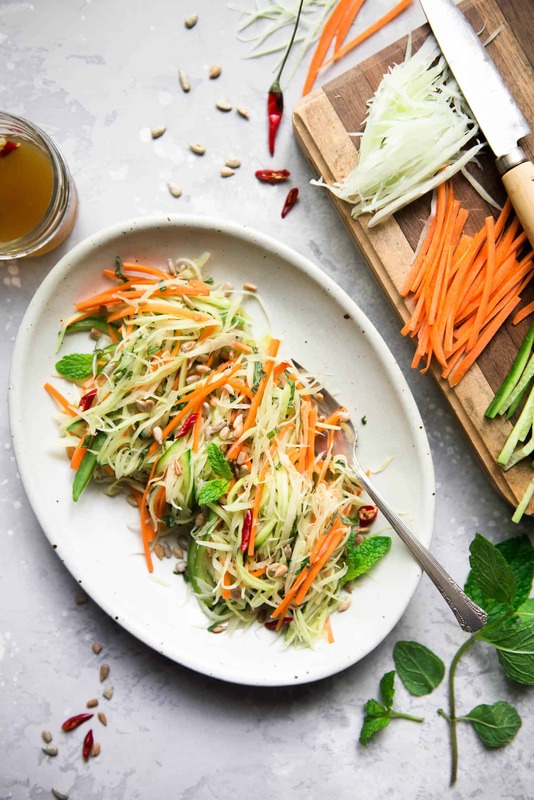 This papaya salad is made from green papaya. It comes from the same fruit as orange papaya, but the harvesting of the fruit at an earlier stage of development leads to its green color. Green papaya is crisp (but not juicy) and it has a very mild flavor, even more mild than cucumbers. It reminds me a lot of kohlrabi. 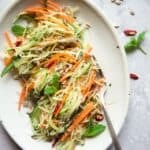 Green papaya salads are often flavored with lime, chilies, garlic, fish sauce, dried seafood, and sugar. In this vegan version, I substituted the fish sauce with soy sauce and used maple syrup to sweeten the dressing. If you like the bright flavors of lime juice, feel free to substitute a few tablespoons of the rice vinegar with lime juice. It is more common to top the salad with toasted peanuts, but I’m using toasted sunflower seeds instead. Sunflower seeds are inexpensive, and I don’t think we use them enough! Shredding the papaya: In the recipe, I explain a method which involves constantly tapping at the papaya with a knife and carefully slicing of layers of shredded papaya. This process can be quite tiring on the wrist and forearm. For a video of the shredding technique, watch this video. Another way to shred the papaya is to slice it in half lengthwise. Then, use a spoon to remove the seeds and strings. After removing the seeds, from the papaya, slice each half into quarters. Next, make very thin slices of papaya using a mandoline. Gather up the sliced papaya and julienne them into thin strips. A third method is to grate the papaya with a box grater, though I haven’t tested this method myself. Using a julienne peeler: I’ve tried shredding the green papaya with a julienne peeler and the cross blade of my mandoline, but neither option worked well. I simply couldn’t push the papaya through the cross blade, and the julienne peeler just scraped the surface of the papaya without making any shreds. This salad is great for making ahead. It will keep for 1 to 2 days in the fridge. Wait until you are ready to serve the salad to mix in the chopped mint and toasted sunflower seeds. Recipe adapted from the Green Papaya Salad in Cameron Stauch’s Vegetarian Viet Nam. Prepare the papaya: Slice off the ends of the green papaya. Using a vegetable peeler, peel the outer skin. Hold the peeled papaya with one hand and tap the papaya with a sharp knife with the other other. You should see shallow knife marks on the papaya. Carefully slice off a layer of the papaya (where you have been tapping), creating green papaya shreds. Watch this video for the technique. If this method seems a bit dangerous or tiring to you, see the notes above for an alternative shredding method. You only need about 4 1/2 cups of shredded green papaya. 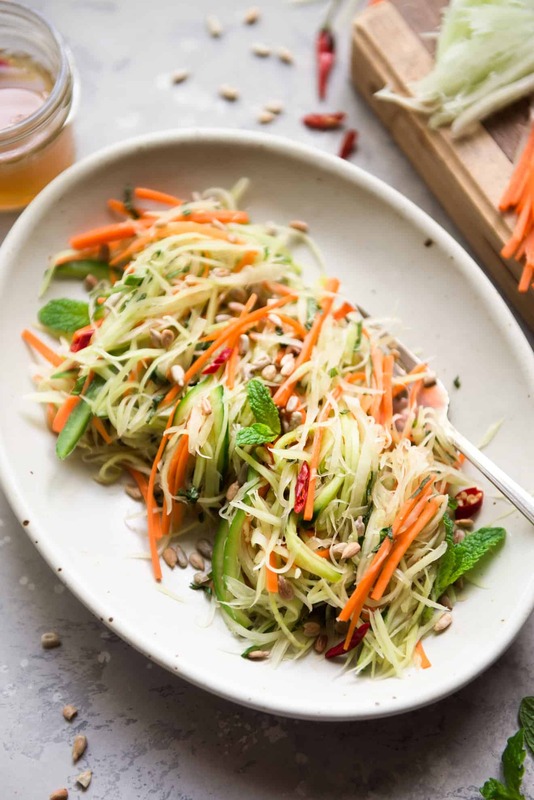 Toss the salad: In a large bowl, mix the green papaya, carrots, cucumber, mint and sunflower seeds. Pour in the dressing that’s been marinating and toss to coat the vegetables with the dressing. Serve immediately. *These chiles are quite spicy, so 1 is usually good enough for me. Feel free to go for 2 if you love the spice! You’ll probably have a lot of dressing settling at the bottom of the mixing bowl. I usually drain the dressing and save it for another salad. You can also add other vegetables to this dressing, such as tomatoes and bell peppers. Hi Lisa, Great recipe adaptation of my recipe! I also suggest to use toasted sunflower seeds if you don’t want to or can’t eat peanuts. I look forward to scrolling through and trying other recipes on your blog. Keep up the great work! Thank you so much, Cameron! Love flipping through your cookbook! This recipe actually came out MUCH better than I expected! I’m a huge fan of Laos style papaya, with 3 or more different forms of fish, but this actually came out delicious! Not nearly as strong smelling which is great for my family and much quicker to make! Thank you!